29 years, 8 months, 5 days old age. Napoleon Einstein will turn 30 on 16 August, 2019. Only 3 months, 25 days, 10 hours, 6 minutes has left for his next birthday. Napoleon Einstein has celebrated the total number of 29 birthdays till date. See the analysis by days count and bar graph. Napoleon Einstein was born on 16th August 1989, in Chennai, Tamil Nadu, India. He is an Indian Cricketer. Napoleon Einstein is a right-handed opening batsman and a part-time off-spinner. He plays for Tamil Nadu in the domestic circuit and for Chennai Super Kings, the tainted team of the Indian Premier League. Einstein made his List A debut for Tamil Nadu against Kerala in a Ranji One-Day Trophy match in 2007. He is a natural opener as he has sound technique and can negate the swing bowling. He scored 92 in his very first match, putting on an opening stand of 203 with Murali Vijay to set up a 46-run win. 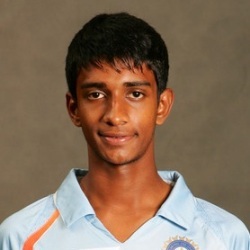 Looking at his domestic performance he was selected for the U-19 World Cup Squad. He was a part of the winning team under the leadership of Virat Kohli that won the ICC Under-19 World Cup in Malaysia in the year 2008. He played alongside Virat Kohli and Ravindra Jadeja. Napoleon once gave clarification about his name that his grandfather was a scientist and he even wrote a letter to Albert Einstein. And since his mother is a physics teacher so he got his name Einstein from his mother and Napoleon is his dad’s name. He said people in our family are named after great people.